Exhibition Counters Feature A Kidney-Bean Shape! This Allows A Place For Representatives To Stand! 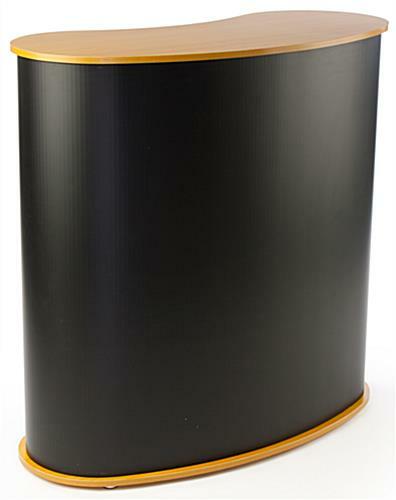 Buy Exhibition Counters From FoldingTablesNow.com Today! Exhibition counters include portable carrying cases! 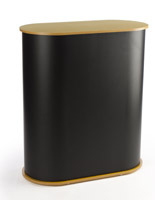 Black corrugated plastic construction is lightweight but durable! 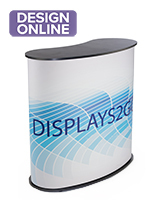 Velcro® attachments make the exhibition counters quick & easy to set up! Kidney-bean shape is ideal for making presentations! 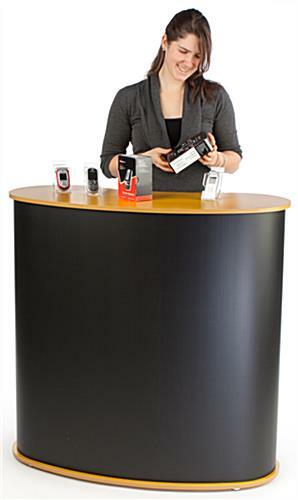 These exhibition counters provide an area for trade show exhibitioners and attendees to interact. 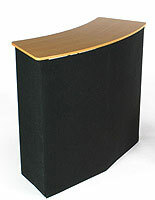 The furniture is also great for product presentations or as a "free sample" booth at retail outlets. 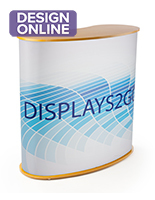 The exhibition counters purchasable here, alias portable displays, can stand alone or be placed within an existing trade show booth. 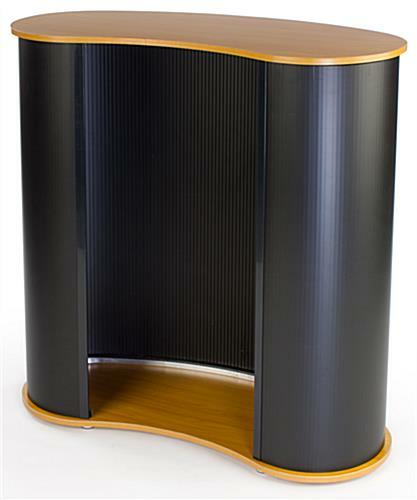 The black sidewalls with wood-grain base and countertop coordinate with many existing booth setups. 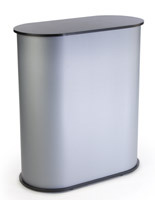 These exhibition counters that include a convenient carrying system are versatile and designed to last for years. The displays are lightweight for easy transport between events. 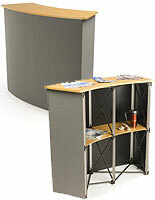 These promotional stands, exhibition counters that stand within a trade show booth kiosk are crafted from corrugated plastic and medium-density fiberboard, or MDF. The countertop measures 41-1 4" wide by 18-1 4" deep and features a kidney-bean shape to comfortably hold a representative behind it. 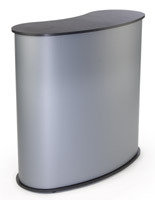 The exhibition counters that are ideal for various promotional needs are often used to hold product merchandise samples, corporate literature, business cards, brochures and more. 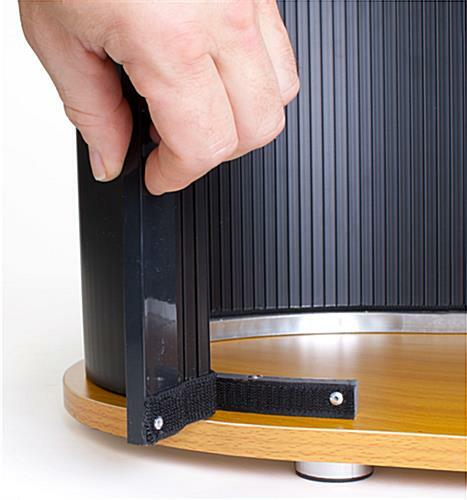 The furniture breaks down and sets up with ease due to the hook & loop attachment system. 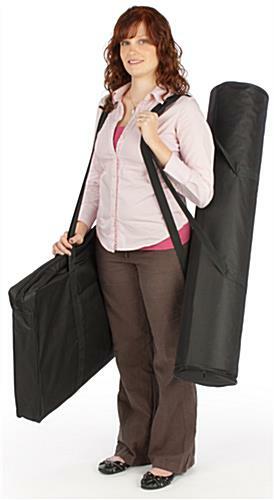 The entire unit fits into two included bags with carry handles for portability.